In addition to Georgia Chicken I also published today: “Most people say they want to be happy but…” Click here to read that post. I was born in Alabama but my husband (married 18 years this month) was born in Georgia, so I always say I’m half Georgian by marriage. I also claim dual citizenship with Tennessee since I’ve never lived more than ten minutes from the AL/TN state line. So me being all woman of the world and holding a trio of citizenships to exotic locales, you’d think I’d be pretty worldly with my food, too. Okay, y’all probably know better. In fact, y’all probably know me well enough at this point not to be the least bit surprised by any weirdness that comes out with regards to how my brain works. Well, get ready for another episode of “Christy’s aversions” and today’s feature is entitled “The thing about meat and fruit”. I generally don’t like them together. Fruit is the dessert in my mind and should be separate. So here I am, posting the thing, and hoping you’ll make it soon. Georgia Chicken should be known near and far – but it’s not…yet. This recipe is an adaptation from one I found on the Georgia Peach Board’s website a couple of years ago and it’s one to pass down for generations. To make this you’ll need: Chicken, Cloves, Ginger, Light Brown Sugar, and Peaches. I’m using boneless skinless chicken breasts but bone-in would work just fine, whatever cuts you want to use. Just use your common sense and check for doneness. Smaller pieces, of course, might require a little less time, larger pieces might require more. You can also use fresh peaches, however many you like. I prefer more peaches rather than less so feel free to go crazy. Just peel ’em and slice ’em and you’re ready to go. This is really a very low fuss recipe. In a small bowl, stir together the brown sugar, cloves, and ginger until well blended. 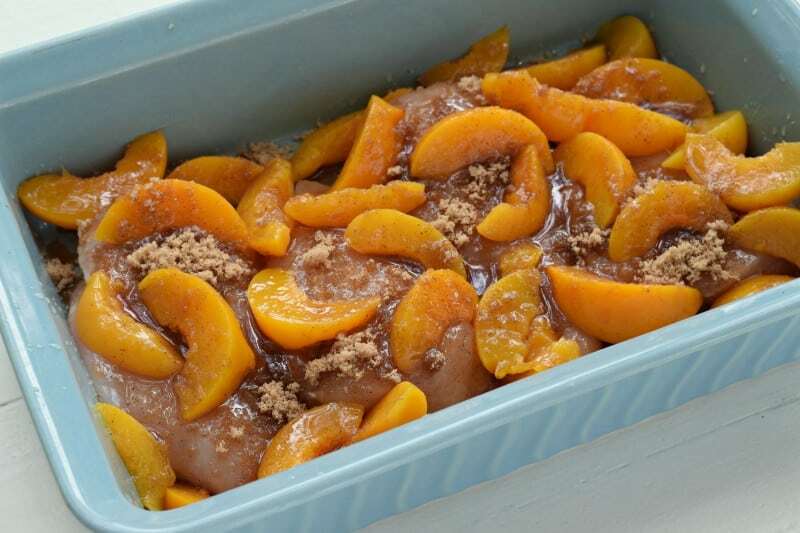 Place chicken in 9×13 baking dish and pour peaches over the top. Sprinkle the whole party with the brown sugar mixture and place in the oven for 34-40 minutes, or until your chicken is done. Every now and then, baste chicken with the juices in the pan. I prefer this served with a light side dish. I just added some fresh spinach and used pan juices and more peaches for the dressing. Take it OVER THE TOP by making a pitcher of Southern Breeze Sweet Tea! This tea perfectly sweetens itself as it steeps and is carb free, calorie free, and the absolute closest I have found to real sugar sweetened tea. Usually fruit teas are off limits due to the sugar (and carbs) but this Southern Breeze Peach is a game changer! Click here to see my post where I show how I brew this tea directly in my pitcher in just a few minutes. On the website, click “sweet deals” up at the top to print off a $1 off coupon (at time of publishing this). Preheat oven to 350 and spray a 9x13 baking dish with cooking spray. Set aside. In small bowl, stir together brown sugar, ginger, and cloves. Place chicken in bottom of prepared pan. Pour peaches over. Sprinkle entire thing with brown sugar mixture. Place in oven and bake for 35-40 minutes, or until chicken is fully cooked, basting with the pan juices from time to time. *You can use bone-in chicken for this, any cut you like. Cooking time may need to be adjusted up or down depending on what cuts you use, so just keep an eye out for doneness. Hi Kathy! Visit http://southernbreezesweettea.com/ to learn more about Southern Breeze Peach Sweet Tea- it goes perfectly with the Georgia Chicken! This sounds so good, I would have never thought to put peaches with chicken. This will be ou Sunday dinner this weekend, I can almost smell it now. Oh my goodness gracious, I am drooling this just reading the recipe. Chicken and peaches are meant for each other. This will be on the menu once it cools off enough outside to turn the oven on. Now I am wondering if I can do this in my Casserole Crock Pot Slow Cooker. Hmmmm????? I think it would work beautifully in that. How long do you think it would take in the casserole slow cooker? I’ve only used mine once so far. I don’t have one of those casserole slow cookers and have never used one but for a regular slow cooker the general guideline is always 3-4 hours on high and 7-8 on low. I imagine it is likely the same. Hi Barbara! Visit http://southernbreezesweettea.com/ to learn more about Southern Breeze Peach Sweet Tea- it goes perfectly with the Georgia Chicken! I have done this with cornish hens and used peach jam (also plum jam, cherry jam, apricot jam, apricot/pineapple jam, and jalapeno jelly…)instead of the brown sugar, makes an elegant dish with wild rice. Hi Ravyn! Visit http://southernbreezesweettea.com/ to learn more about Southern Breeze Peach Sweet Tea- it goes perfectly with the Georgia Chicken! I make this with my Catering Service. We also add sprinkle of tarragon and a couple spoons of pepper jelly. We call it Peachy Chicken! Love your recipes!!!!! Hi Paula! 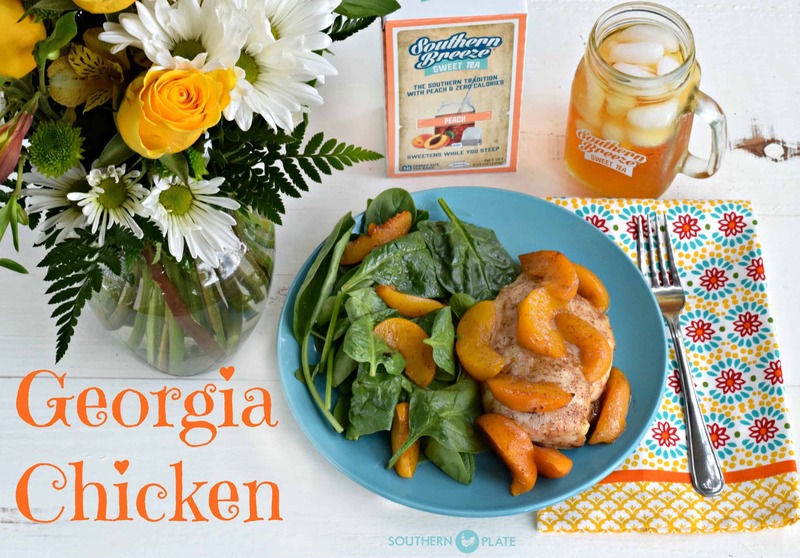 Visit http://southernbreezesweettea.com/ to learn more about Southern Breeze Peach Sweet Tea- it goes perfectly with the Georgia Chicken! I’m glad you posted this! Although I don’t care much for meat and fruit, I made up a recipe for this years ago (less sugar, more spice) and call it Ginger-Peachy Chicken. Your recipe will probably make very good pork, too as many pork recipes are interchangeable with chicken, and vice versa. Oh my goodness, I feel the same way about fruit and chocolate! Raisinettes are the only exception there. You are so right about chicken and pork. Hi Philippa! Visit http://southernbreezesweettea.com/ to learn more about Southern Breeze Peach Sweet Tea- it goes perfectly with the Georgia Chicken! I think I am in your former camp of no fruit and meat together but I am more than willing to give your recipe try. Come to think of it I do like pineapple and ham together so maybe I have already crossed the line! Is it ground cloves? Can’t imagine it with whole cloves. Christy,love your recipes…I would like to now if it can be made without cloves? Hi, Christy! This looks amazing and it may just be what’s for supper! 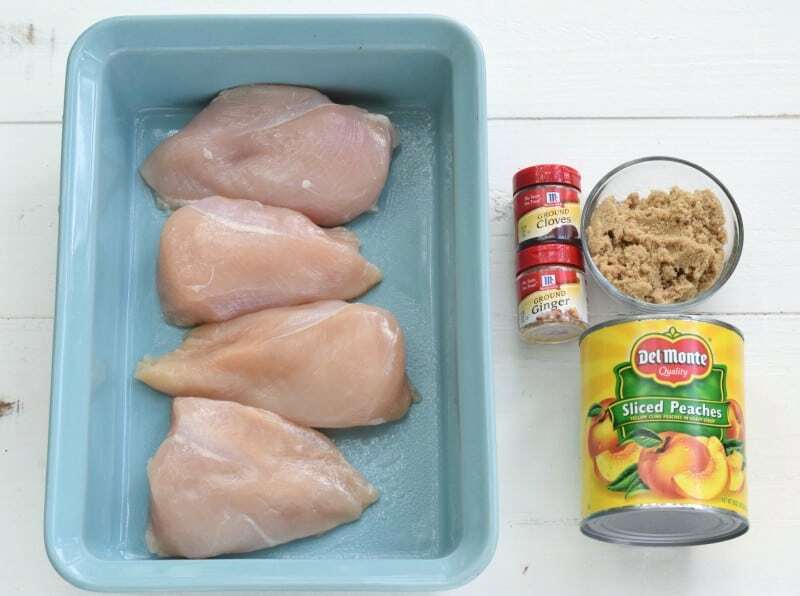 As I scrolled down, because I saw glistening on the raw chicken in your photo (which looked like more than just damp meat), I assumed one should not drain the peaches—or, maybe just some of the juice should be used. But, then the recipe clearly says “drained.” What keeps this from drying out if no juices are used? Even though you drain them, the peaches still weep out a good bit of juice as they cook, so much so that you can actually baste the chicken with it :)The chicken has some natural juices as well. Do you think frozen peaches would work? I already have some of those, and they’re more like fresh than canned are when they’re thawed. Should I thaw them first? Hi Meredith! Visit http://southernbreezesweettea.com/ to learn more about Southern Breeze Peach Sweet Tea- it goes perfectly with the Georgia Chicken! Can I use something else like cinimin or all spice instead of cloves? I don’t have cloves at the moment and prefer not to buy a spice I would only use for one recipe. This sounds yummy though and I can’t wait to try it. I think either cinnamon or allspice would be a nice stand in. 🙂 Great thinking! Hi Jen! Visit http://southernbreezesweettea.com/ to learn more about Southern Breeze Peach Sweet Tea- it goes perfectly with the Georgia Chicken! Oh my goodness, I hope you have a quick recovery Jerriann!! I used to a recipe for cornish hens with apricot glaze and this does not seem weird to me in the least. On the contrary it seems DELICIOUS! Lady it looks like you have found some kind of way to make one of my favorite things on earth – pickled peaches (spiced peaches) into an entree!!! I am a GA girl living in FL after too long in Ohio but GA will always have a BIG place in my heart. 🙂 I hope you get the chance to try it soon Meridith, I can’t wait to hear what you think!!! I just made this last night. It was very good and easy to make. Thanks for sending me another recipe Christy. I never thought to put chicken and peaches together. I am so glad you liked it Anna!!! My husband is on a very restrictive diet and can’t have refined sugar. What do you think about making this with no sugar added peaches and honey instead of the brown sugar? I think it should work. If you give it a try I would love to know how it turns out! Christy, we just had Georgia Chicken for supper and it was delicious! My husband said, “This is a keeper!” I knew to keep the recipe after that comment. It is not only delicious but it is soooo easy to fix, too. What more could you ask! Thanks so much for sharing the recipe! I am so glad it was a hit! !